The love-fest of Valentine's Day is over and it's time to get back to the blood-fest. 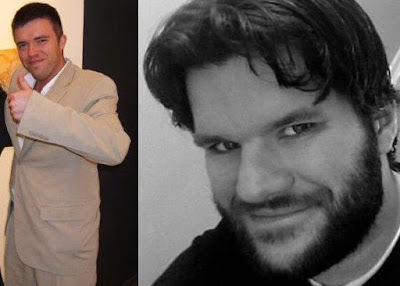 The latest Writer Fight pits the reigning champion Matt Bell (who defeated Blake Butler in the first WF) against the scrappy southerner Scott McClanahan. Matt Bell is the author of the wildly popular How They Were Found. He also edits The Collagist. Scott McClanahan is the author of the wildly popular Stories II. He new book, Hill William, will be coming out on the New York Tyrant label. Both of these lads know how to throw words. But who can throw the best fists? You decide. The poll closes Sunday, February 20th, 2011. Let's get it on! Before meeting Matt at AWP my money would have been on him. He's a puppy. But he's crazy in the head. Scott wears his crazy on his Appalachian hipster sleeve. sco mac (as he's known in the underground fight clubs) is having his way early on. things could change, though.